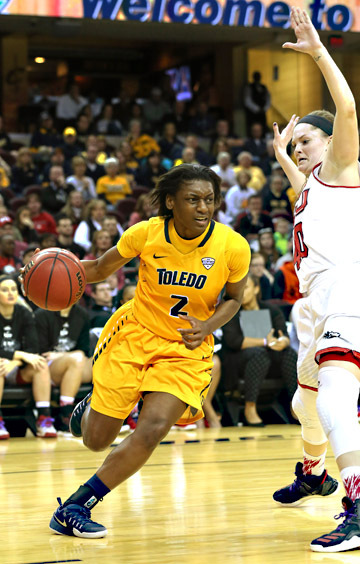 Sophomore guard Mikaela Boyd scored 27 points and grabbed 14 rebounds to lead Toledo to an 82-71 victory over No. 4 seed Northern Illinois in the championship game of the Mid-American Conference Women’s Basketball Tournament Saturday at Quicken Loans Arena in Cleveland. It is the first MAC Championship for the No. 6 seed Rockets since 2001, and the first ever for Tricia Cullop in her 17 seasons as a head coach. The Rockets celebrated on the court after winning the MAC Tournament. Sophomore guard Olivia Cunningham added 20 points, and freshman guard Mariella Santucci chipped in with 13 for Toledo, which trailed by one point after three quarters, but outscored the Huskies 34-22 in the final 10 minutes to claim the victory. Boyd was named the tournament MVP, and was joined on the all-tournament team by Santucci. Toledo (25-8) broke open a close game with a 14-0 run midway through the fourth quarter that turned a 54-50 deficit into a 64-54 lead. Northern Illinois (21-11) never got closer than eight points the rest of the way. 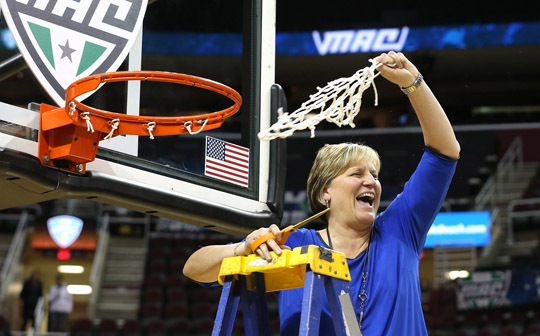 Head Coach Tricia Cullop was all smiles as she finished cutting down the net after the big win. Toledo’s defense was the key factor as the Rockets held NIU to just 31.6 percent shooting from the field. Junior center Kayla McIntyre led the defense with a career-high six blocks and 11 rebounds. Toledo controlled the boards by a 50-42 margin. Neither team shot the ball particularly well in the first half, which was played to a 30-30 stalemate. The Rockets made 13 of 36 (36.1 percent) from the floor, while NIU connected on just 11 of 40 (27.5 percent). Toledo edged out to an 8-4 lead on a jumper by junior guard Jay-Ann Bravo-Harriott at the 5:42 mark. The Huskies struggled early against the Rockets’ pressure defense, hitting just two of their first 15 shots from the field. But they began to find the mark as the quarter wound down, taking a 13-12 lead at the end of the first quarter. Sophomore guard Mikaela Boyd scored 27 points and grabbed 14 rebounds to lead UT to an 82-71 victory. Both teams began to warm up in the second quarter. UT used a 12-5 run to open the period to take a 24-18 lead, culminated by a fast-break layup by Boyd at the 5:20 mark. The lead moved to seven, 30-23, on back-to-back three-pointers by Cunningham, the second forcing an NIU timeout with 2:09 left in the half. The Huskies finished the half on a 7-0 run to knot the score at 30-30 at halftime. Northern opened up the second half with a 15-8 run to take a 45-38 lead with 3:37 left to play in the third quarter. Toledo suffered a blow when Bravo-Harriott picked up her fourth foul midway through the period. Toledo crawled back into the game thanks to six third quarter points from Santucci and was trailing, 49-48, heading into the fourth quarter. Toledo surged into the lead early in the fourth quarter, thanks to a 14-0 run that put the Rockets up, 64-54. The run was capped off by a three-point play by Santucci with 4:54 left. NIU could not get closer than eight points the rest of the way, as Boyd took over, scoring 14 of her game-high 27 points down the stretch, including six of six from the free-throw line. 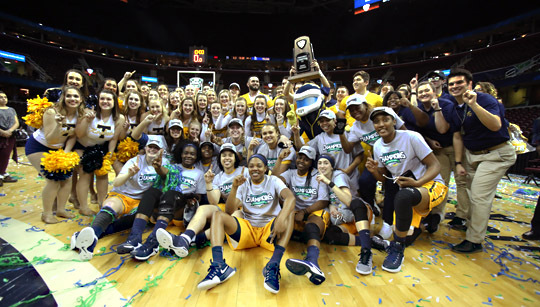 The Rockets will find out their NCAA Tournament opponent and location during the NCAA Selection Show on ESPN Monday, March 13, at 7 p.m. This entry was posted on Saturday, March 11th, 2017 at 3:38 pm and is filed under Athletics, News .